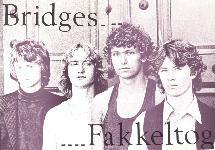 Pål Waaktaar and Magne Furuholmen's first group was called Bridges. They released a self-financed LP on the record company VÂkenatt in Norway only called "Fakkeltog" (Torch-light procession). 1000 copies were made, but very few of them sold. The music is heavily influenced and inspired by The Doors. This record is the most sought-after record among a-ha fans and you must expect to pay an awful lot of money to get your hands on a copy of this record. The LP has a home-made cover design (photo by Fritz Johannesen) which shows the faces of the group members. In the background there is some text (apparently Norwegian lyrics). The back of the cover shows a field with more lyrics printed upon it. This is not the complete lyrics for the album, only drafts and excerpts. The record in itself is quite unique as it has a stop mark on side B. This is done to divide the record into the three seperate parts called "The Oncoming Of Day", "The Oncoming" and "The Oncoming Of Night". One side of the LP has a black label with grey text listing the tracks for "The Oncoming Of Night". 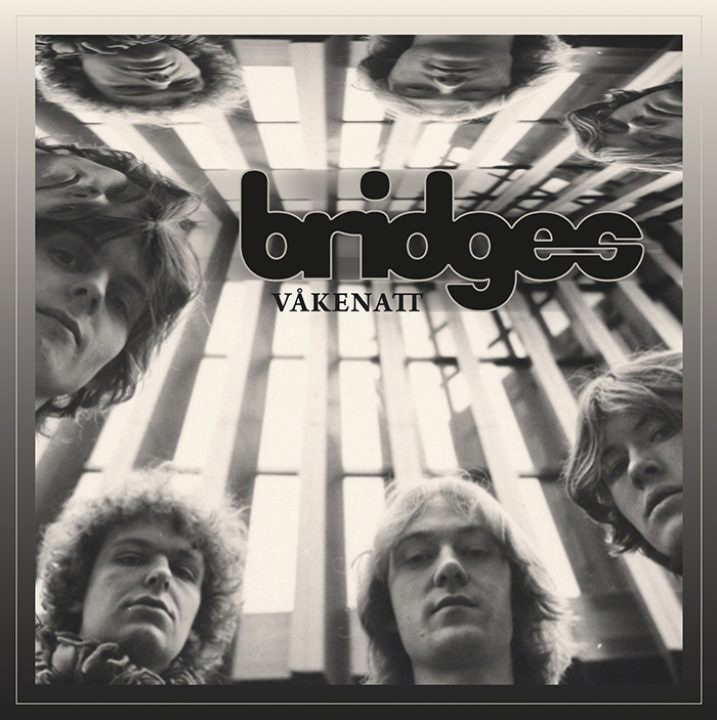 "Våkenatt Presenterer" and "Bridges..." have been printed in large grey capital letters above the track list. The other side of the LP has a white disc label. The top half features red text with "...Fakkeltog" and track list for "The Oncoming". The bottom half of the label lists the tracks for "The Oncoming Of Day" in black text which is printed upside down compared to the text in the top half. A black line divides the top and bottom sections of the label. An even rarer edition of the LP contains a poster (around 1000 copies came with a poster - TBC?). There are two posters available; one has lyrics to three songs printed across the groupshot while the other comes without the lyrics. The album was produced by Svein Erichsen, mixed by Svein Erichsen and Tore Aarnes. It features PÂl Waaktaar on guitar and vocals, Magne Furuholmen on synthesizers, Øystein Jevanord on drums and percussion and Viggo Bondi on bass guitar. The track "Vagrants" features ÿivind Nusle and Hans Morten Stensland on violins, Svein Ivar Fors and Elisabeth Moe on cello, Ingvil Kaalhus on obo. "September" features Gro Hanne Fors and Sissel Gr¯nlund on tumpets. The songs, arrangements and lyrics are all by PÂl except for "Vagrants" which is arranged by Erik Nygaard. The songs on this album are all sung in English. 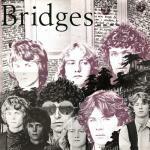 This is the only album released by Bridges, the band started another album by the name of "Poem" but it was never published. The a-ha song "This Alone Is Love" features song text from the Bridges songs "May The Last Dance Be Mine" ("It will make my last breath pass out at dawn It will make my body dissolve out in the blue") and slightly adapted lyrics from "Every Mortal Night" ("Travel by trap-doors our souls are a myrid of wars And we are losing everyone"). 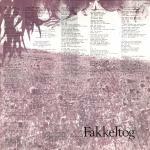 An extremely rare item is a test pressing of "Fakkeltog" which includes an alternative cover handmade by Pål Waaktaar. There is an LP sized paper sheet which Pål has coloured in and stuck cuttings on. 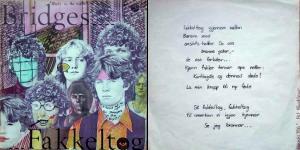 Also included is a paper sheet with hand written lyrics and corner credit "Fakkeltog" Pål Waaktaar. This test pressing does not come with the regular "released version" of the cover. The Polygram labels on the disc state that it is a testpressing and the details have been hand written below. The date give is 22.8.1980. In 2012. there was an unofficial release of the "Fakkeltog" album by Luna Nera Records (limited to 330 copies). 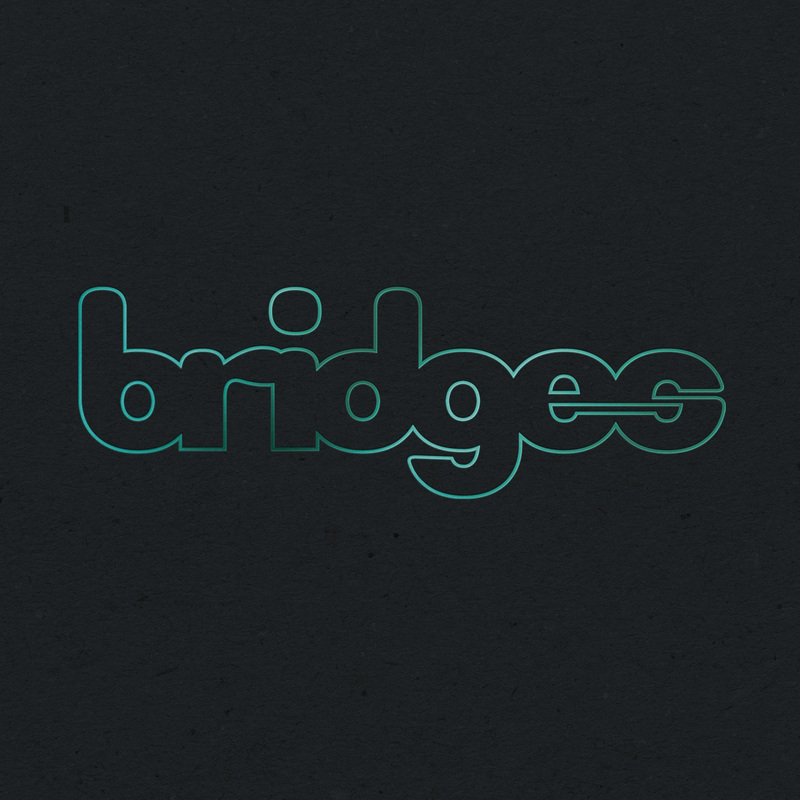 On 15 August 2018, 38 years after the album was records, Bridges released their second album "Våkenattquot; ("Sleepless Night"). The album was recorded by Paul Waaktaar-Savoy, Magne Furuholmen, Viggo Bondi and Øystein Jevanord in December 1980 and January 1981 at Sound Art Studio in Skippergata, Oslo but never released. This 10 track album was produced by Svein Erichsen. The album was released by Rockheim Musical Archives in Norway as a limited edition numbered green vinyl (180 gram). It comes in a black box with bridges printed in large green outlined letters across the middle. The reverse of the box is also black with green lines pointing towards the centre. 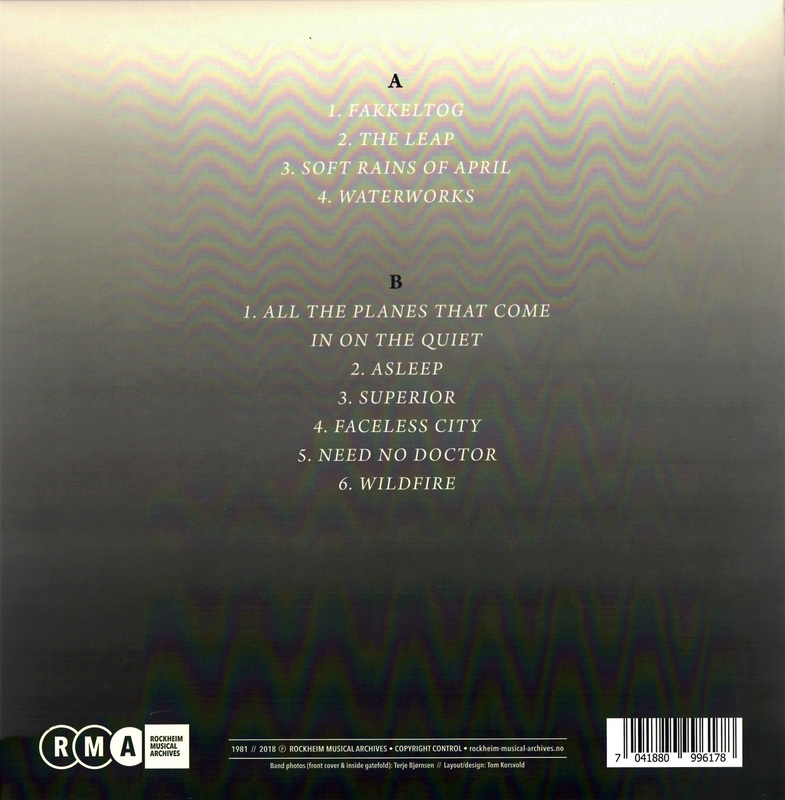 On either side is the track listing in white and the title is printed in large faded grey letters at the top with twoletters on each line and reading downwards. The record company logo, copyright information and barcode in white at the bottom plus a "LIMITED EDITION" which sticker with a hand written number. Inside the box is a 3-fold LP sleeve. The front of the sleeve features a black and white picture of the band all looking down towards the camera with part of the picture reflected along the top. 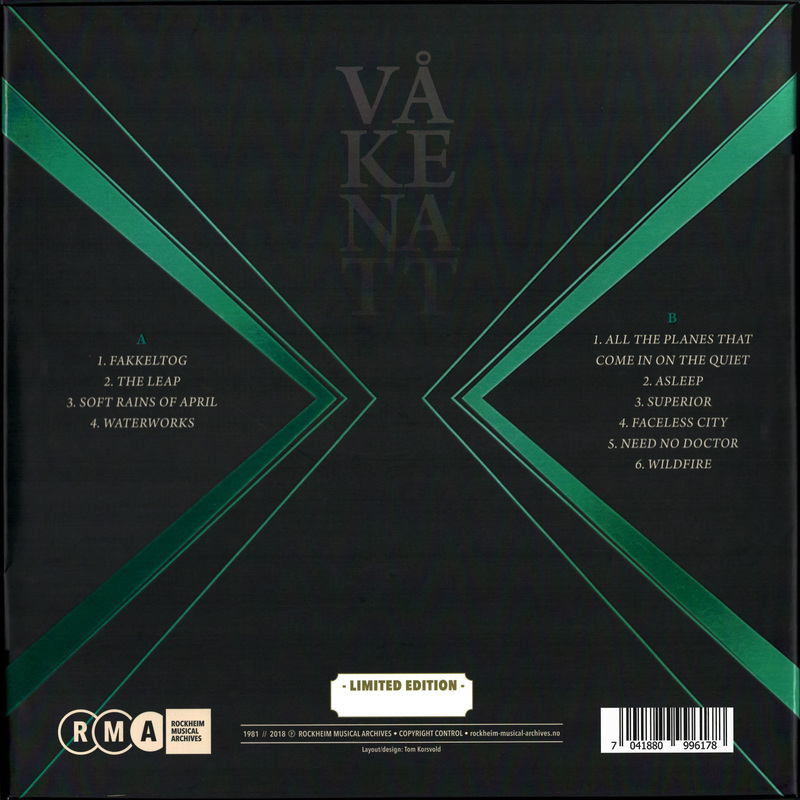 "bridges" and "VåKENATT" are printed in black large letters towards the top of the sleeve. There is a frame around the picture which is dark at the bottom and fades to light at the top. The back of the sleeve is dark at the bottom and fades to a light grey at the top. The track listing is printed in white down the centre. The record company logo, copyright information and barcode in white at the bottom. 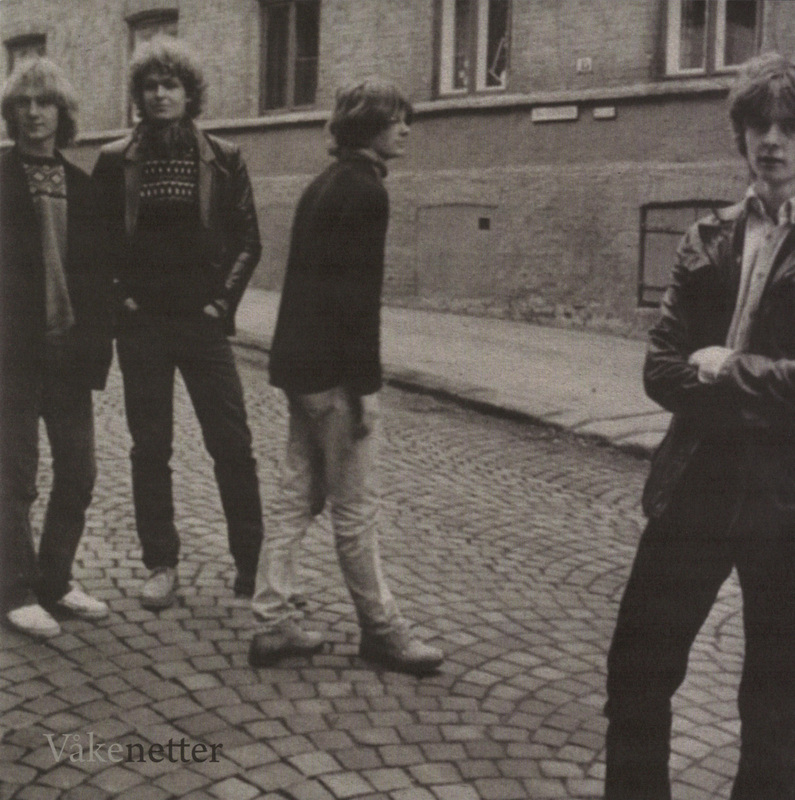 The inside of the sleeve features one long black and white picture of the band standing and leaning against a window. The reflection of the band in the window can be seen on the right hand side. A 16 paged booklet is housed in the left hand end of the sleeve. 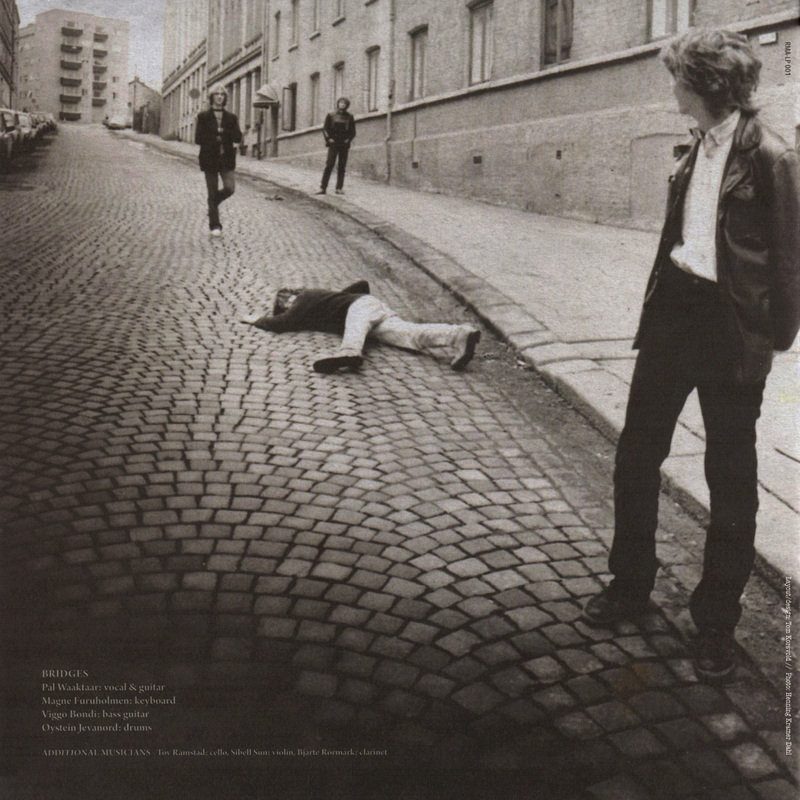 The front and back cover of the booklet feature two more black and white pictures of the band standing and lying in the street! The vinyl is housed in the right hand end of the sleeve. It comes in a black paper sleeve. 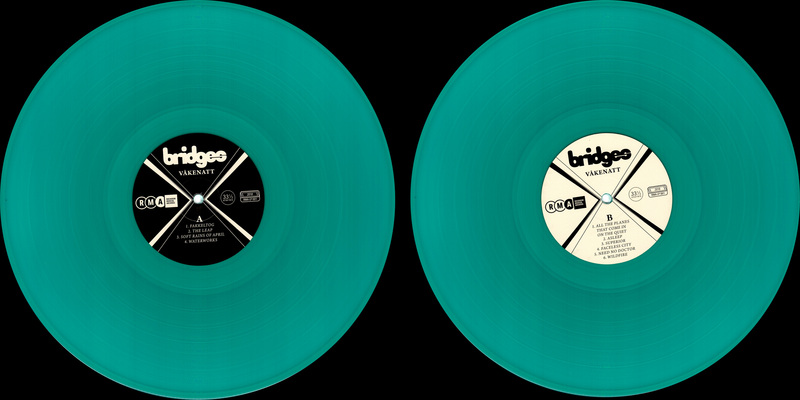 The disc is a bright aqua green. The label on the A-side is black with white lines pointing towards the centre in a similar way to the back of the box. 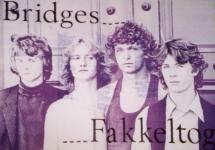 quot;bridges" and "VåKENATT" are printed in white at the top with the record label logo on the left, 331/3 stereo plus year and catalogue number on the right and track listing at the botto. Side B label has the same design but inversed colours.